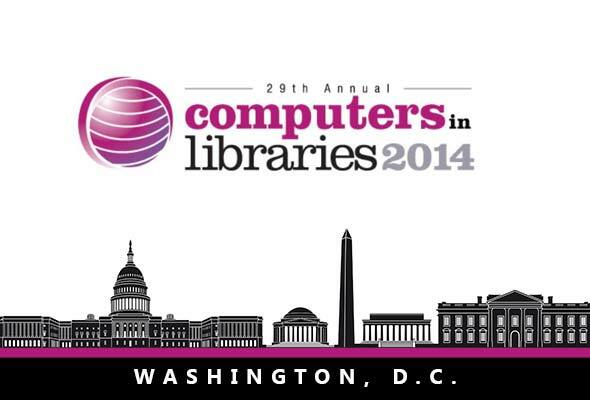 I will be at the Computers in Libraries (CIL) conference in Washington, DC this April 6-9 to give a short talk and participate in the Future of Libraries: Survival Summit. I will present a CyberTour about “Three Future Oriented Tech Trends” and hope to connect with the brightest minds in library technology. CIL is a favorite annual library tech conference with great content and this year a summit specifically for library leaders. My short CyberTour talk, “Three Future Oriented Tech Trends to Leverage This Year,” on Monday April 7 at 1pm in the exhibit hall will explore tech areas that provide opportunities and implications for the library environment. Technology trend areas covered will likely include Mobile Messaging apps, wearable technologies, and the Internet of everything. I will discuss what these technologies mean for libraries and what they reveal about the near future. Sometimes technology is about opportunities and sometimes it is about implications. This session investigates three tech areas that provide opportunities for library service and implications for the library environment. Make sure to check out all of the amazing CyberTour speakers lined up. Innovative Interfaces is sponsoring this summit to support strategic leadership approaches to library futures. I will speak briefly and participate in the event. I will be interviewing insightful thought leaders during CIL for sharing on Instagram Video, YouTube, and Vine. Are you a forward thinker? Let’s meet. Who should I make sure to connect with at CIL? What ideas are going to rock our boat in DC this year? What off the beaten track sites should I make sure to see while in DC? See you in DC! bring your most future facing disruptive ideas.